I’d been disappointed by my returns to Pokémon since what I perceive to be its heyday in the late 90s. It’s a series whose advancements between iterations had been conservative by even Nintendo’s standards, with everything from its templated story to the designs of its new Pokémon exhibiting diminishing returns. X and Y, though, while still not a reinvention, felt refreshed. Actual 3D graphics, like anyone who’d played Pokémon had wanted since the N64 days, were the banner feature and injected personality into the limited sprite-based characters of yore. Also impressive was the well-integrated networking, which brought social aspects that only a game with the popular clout of Pokémon could pull off – I’m still waiting for my first Fire Emblem StreetPass, but Pokémon was netting me a couple a day. A nice reminder of what a world where the 3DS was an unmitigated hit. 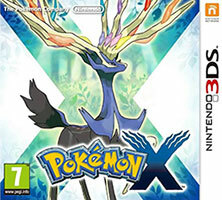 I still say we need a Pokémon game that really mixes things up in the way that past transitions to 3D have done for Nintendo’s popular franchises, but X and Y were at least a step towards that. Kudos for being the first instalment I’ve enjoyed since the GBA.